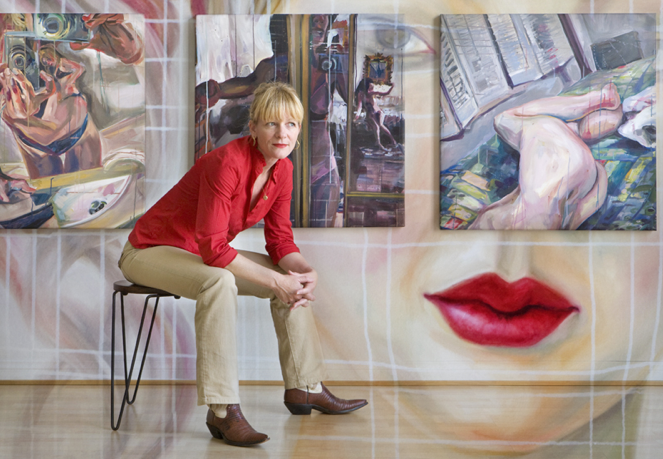 Anna Stump is an artist and arts educator living in San Diego. She earned her Bachelor’s degree at Occidental College and her Master of Fine Arts at San Diego State University. She was a Senior Fulbright Scholar to the Fine Arts Department at Anadolu University in Eskisehir, Turkey in 2006-2007. She teaches studio and art history courses at San Diego City College and Grossmont College. Anna’s New York Times reviewed blog of three years, Kloe Among the Turks, examines the art scene in Southern California and Turkey, as well as issues of arts education. In 2009 she curated an exhibition of 130 artists from Southern California and Turkey, presented in San Diego, Los Angeles, Istanbul and Ankara. In 2017 she was awarded a residency at Cill Rialaig Arts Centre in County Kerry, Ireland, where she produced work for her "Terrarium" series. Anna is the founder of the San Diego Feminist Image Group, and one half of the painting collaboration Hill&Stump. She is a member of Mid-Air Trio, an improvisational group that combines painting, dance and soundscapes in live performances. The artist is represented by Sparks Gallery in San Diego.